In this volume we have traced the entangled network of the politics of ‘nature’ to see how it changes over time. We went from the gardens to the gardeners, to bodies, plants, senses and, finally, to enchantment. The garden and its non-human elements have their own politics. They set their own rules which the gardener must follow in order to weave a collaborative, mutual and productive relationship. Therefore, we argue that ‘the political’ is not only the affairs of state and governance. 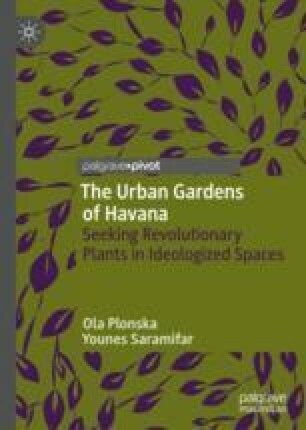 The political is an all-encompassing part of life that begins and evolves in the poetics and the minutiae of lived experiences in Cuban small-scale urban gardens and biospheric existence. It is not unwarranted to ask the social sciences to focus on the microscopic and the day-to-day level to illuminate how the political affairs of lives could be imagined differently and may even be altered.